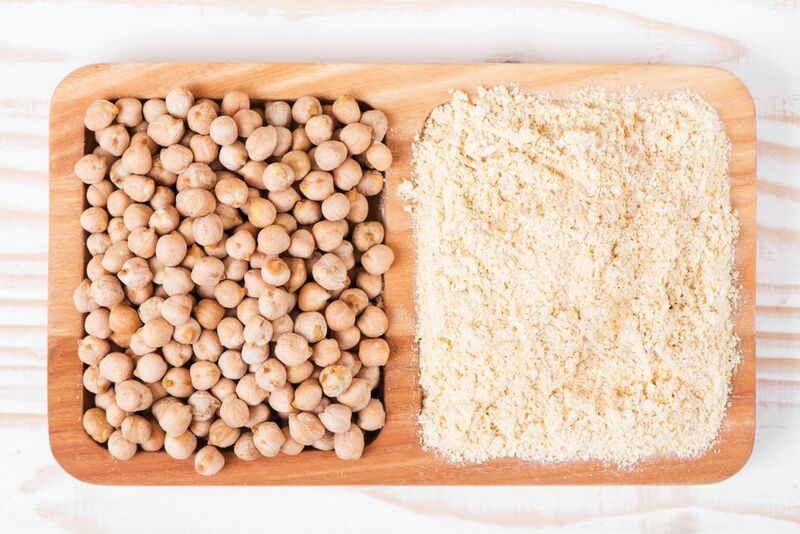 Chickpea flour is made from dried chickpeas (garbanzo beans) and is also commonly known as garbanzo flour, gram flour, and besan. Chickpea flour is a staple of Indian, Pakistani, and Bangladeshi cuisines. In Morocco, garbanzo flour from un-roasted chickpeas is used to make kalinti, a quiche-like dish often sold as street food. Chickpea flour can be found in Asian and Middle Eastern markets, but you can easily make it at home from dried chickpeas. It's easy to do and takes about 10 minutes. All you need is a food processor and spice or coffee blender. You can roast your chickpeas lightly and cool them completely before grinding them to yield gram flour or besan, but for many recipes that step is unnecessary. Place the dried chickpeas in a food processor, working in batches if you are making a large quantity. Cover and process on high speed for two or three minutes until a powdery flour forms. Cover the top of the feed tube so that chickpea flour doesn't waft out while the machine is running. Sift the mixture into a bowl to separate the fine flour from the hard bits of chickpeas that did not process. Use a spice or coffee grinder to process the remaining bits of chickpeas to a fine, powdery flour. Do this in batches of 1 or 2 tablespoons at a time. When all of the chickpeas have been ground into flour, sift again to remove and discard any remaining pieces of chickpeas that did not process. Store any leftovers in an airtight container and keep it in a cool, dry place. Now, you have fresh homemade chickpea flour to use in recipes! As a vegetable, chickpeas are nutritious. They have a high protein and fiber content and are known to help lower cholesterol, which makes them a good choice for those wishing to replace red meat in their diet. Additionally, they are touted as a beauty aid, benefiting everything from the skin and hair to internal organs. There are many ways to use your homemade chickpea flour. Try one or both of these for starters. Ligurian Chickpea Pancake: This is an Italian pancake or flatbread called a farinata that is made with chickpea flour that is sliced and sold on the streets of Italy. Moroccan Chickpea Flour-Egg Tart: This is a recipe for kalinti, the street food of Morocco. It is a flan- or quiche-like dish made from chickpea flour and eggs and is very similar to Italian farinata.